An interesting initative: Michael Sauers, the Travelin’ Librarian, is working on a project at the Nebraska Library Commission involving materials published under Creative Commons licenses. 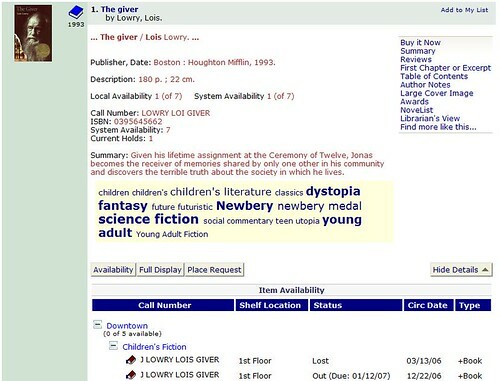 * They have begun incorporating CC works into the library catalog, and — in some cases when the license permitted it — created spiral bound hard copies of books. This is a wonderful idea. The materials are available, their authors are willing, the selectors chose them. Why not help patrons find them in their catalog searches? See Michael’s post in the NLC blog for more info. * Creative Commons is a cooperative licensing plan developed in the last several years and heavily used throughout the social web. There have been many software attempts to help people organize their books, but recent social networking sites have finally made the job convenient and — believe or not — fun. LibraryThing is only one of several social cataloging sites, but it is probably the most consistently innovative of the lot. A member of LibraryThing can enter her titles or ISBNs and let the cataloging muscle of 140 large libraries around the world provide the bibliographic detail. Then she can tweak the content, add tags, browse cover art, rate the books, or write her own reviews. She can even search her books (or anyone else’s) from any Internet connection. In many ways LibraryThing works like a standard library catalog. But it’s a personalized catalog; they’re YOUR books, after all. How cool is that? The social side of LibraryThing lets members browse other catalogs, find members who share the same books, chat in book discussion groups, and swap recommendations. Since the site was designed for book-lovers, readers can engage in all the socializing without the pressure to buy anything. Rethink the catalog. Library catalogs have always been tools to find resources. Social cataloging sites breathe an element of fun into the old tool. Sure, a patron can find specific books quickly, but he can also write and read reviews, discover titles recommended by thousands of other members who share reading interests, and interact with those readers. Tim Spalding and his team at LibraryThing are always tinkering with new features that the library world would be remiss to ignore. You’ll see features here and wish your library’s PAC could keep pace. Book clubs. Encourage members of your book clubs to get accounts. They could leave messages for each other between meetings or might enjoy writing their own reviews when the big monthly group discussion is over. The group might even use the recommendation tools within LibraryThing to find future club titles. Reader’s advisory. Librarians could track the books they read and tag them based on reading level or interest. When asked to recall a good book, their personal lists will be at their fingertips. Some people list books they own; others track all the books they read. Many (myself included) do both. If you love books (you work in a library, don’t you?) you might get carried away with this project. That’s all right. Go at your own pace. Three or four 20 minute visits to LibraryThing might be enough for you to do a little of everything listed below. Of course, if you get the cataloging bug you might burn through all your free time for the next month in LibraryThing. Hey, I’ve seen it happen! Start adding books. Entering ISBNs will help you find exact editions, but title and author keywords work, too. (You might even be able to use a CueCat barcode scanner.) It’s not impossible to enter a dozen or more books in just 15 minutes. The cover art visible on “Your Library” page is usually supplied to LibraryThing by Amazon, but you can benefit from other members’ covers, too. Upload your own cover if you’ve got a rarity. Explore the LibraryThing tag cloud. Look up a few titles in Search and read some reviews. Try the BookSuggester a few times and see what comes up. Add info to your profile page. Be as public or as private as you choose. On your profile page you’ll see links to other members who share your books. Click a few and visit their catalogs. Maybe someone shares your favorite book. Leave a message on their profile page. Partner with someone else doing this exercise and add each other as friends. Wander into the discussion groups and read some entries. Join in, if you want. Most of all: Have fun with your books! It’s your web now. Let’s say you bring up Lois Lowry’s The Giver. The first part of that bibliographic record is straight out of the library’s PAC, but nicely tucked below is a tag cloud piped in from LibraryThing‘s database of 25 million tags. Catalog users would get great visual cues about the book from the few thousand readers who tagged their own copy of the book in LibraryThing. Tim described this concept months ago and has been able to tack it onto the catalogs of a few individual libraries already. I previously mentioned Danbury as the first example but, as far as I know, Bryan Rubenau at Polaris is the first to write code toward fully implementing this stuff into the guts of an ILS software package. His preliminary code rocks. 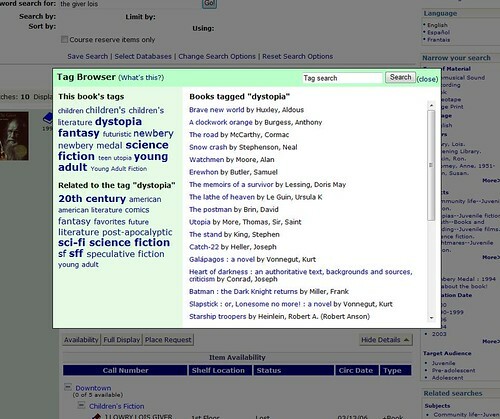 If it goes into a future upgrade*, catalog users might soon search the reader-contributed tags (like “chick lit”) just as easily as they search titles, authors, and subject headings. *At the moment, Polaris is looking into the specific requirements for integration and asking its customers if they’re interested. There’s no formal partnership between LibraryThing and Polaris. Conferences dispense so many topics that it’s hard to pluck just one headline from the annual Polaris Users’ Group (PUG) Conference that wrapped up in Syracuse, NY today. I’ll mention a few snippets now and elaborate later. 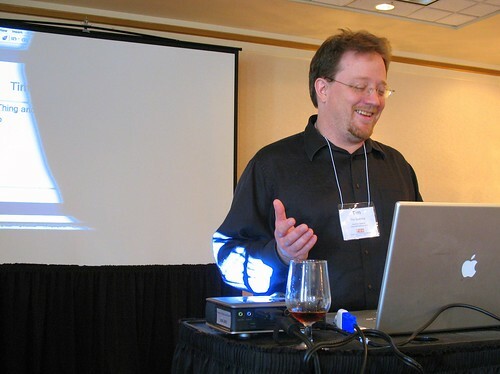 As a fan of social networking tools, my favorite news of the week came just after the keynote: Polaris programmers have written code exploring a connection with LibraryThing. About six months ago Tim started talking up the possibility of integrating catalogs with LibraryThing tag clouds and related books lists. (I remember this clearly because we tried to engrave our library’s name on his list the following day.) The Danbury Library has it working already. It’s pretty slick. In recent weeks, Polaris programmers were intrigued enough to start writing code to its ILS software to maximize all the bells and whistles that would come streaming in from LibraryThing. There’s no formal partnership between the two, mind you, and no certainty that the coding will go into a new release, but there’s enough written code that Polaris gave us a working demo. I’m a bit partial to the toolkit, mind you, but tag clouds and tag-generated book suggestions in the Polaris ILS looks fantastic. I’ll post screen shots in LibraryStream as soon as I get them. I was also intrigued to learn more details about the Dewey-free Perry Branch in Maricopa County (AZ). They made news around the world earlier this year when they opened with a design modeled on contemporary bookstores. Materials are arranged by book industry labels (like “Pets” and “Cooking”) rather than Dewey Decimals (like 636 or 641). Cindy Kolaczynski, Maricopa’s Deputy Director, gave background and a progress report at PUG this morning. I’ve got my doubts about going entirely bookstore-based, but love the spirit of experimentation at Maricopa. If no one tries things like this, we’re all just flapping about theory. I’ll come back to this topic, too. 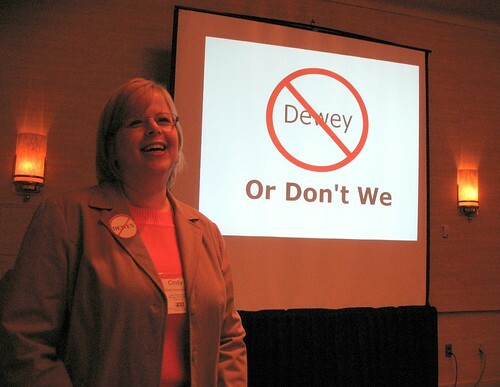 I gave a presentation at this year’s conference — “Training 2.0: How to expose and inspire your staff to the social web” — but I hope that this blog will give you the gist of that over time. Finally, PUG reminded me the value of face-to-face, meet-in-the-hallway connections that happen so often at conferences. To the many new people I met in Syracuse: It’s a pleasure. To those I had met before: Our conversations seemed to simply pick up where we had left off. To those of you going to other conferences: Eat them up.